Overband Magnetic Separators are placed above open conveyors to arrest ferrous objects and fines found in grains, feed stuffs, raw and processed products, dry chemicals, salt, ceramics, Clinkers in Cement Industry, Coal conveying in power plants and many other products. Overband Magnets are used for separating big Ferrous particles like lugs, nuts, bolts, rivets, ms plates, angles, channels and tools from moving material on a conveyor belt. How Does it Work? 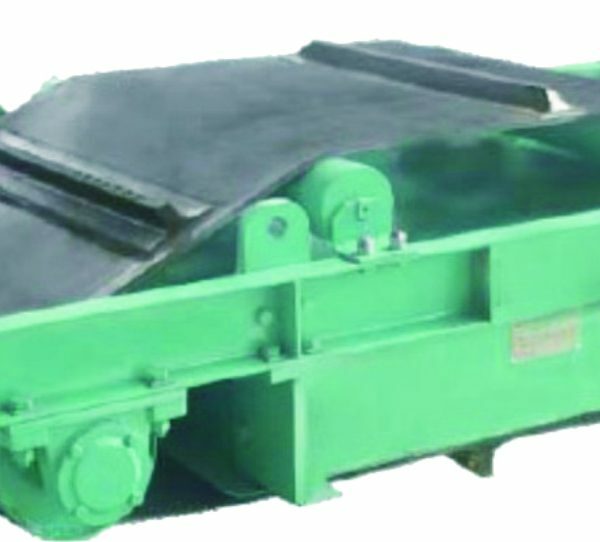 Magnetic Separation Process: The Over band Magnet is placed over the conveying belts carrying the material. This Suspended Magnet system arrests Ferromagnetic materials from distance of 300mm/12 inches from feed material which is transported through the production process. O.B.M.S. are used for resource recovery,raclaiming steel for resale and separating ferrous contaminant from other recyclable material such as crushed aluminium,glass,plastic,tires,concrete or wood.many facilities use O.B.M.S. to protect machinery,such as crushers at quarries, cement plants and mines.at power plants,they keep tramp metal out of coal pulverizers,pulp & paper mills use them on wood chips.in foundries, they remove chills,spruces and gaggers from sand.